I frequently fail at the Türing test when I typically get "Click on the images that contain a car" and have to try over and over. It's a lot more fun than that. Being in the safety/automated driving field myself, I dig up various papes on ... interesting phenomena. 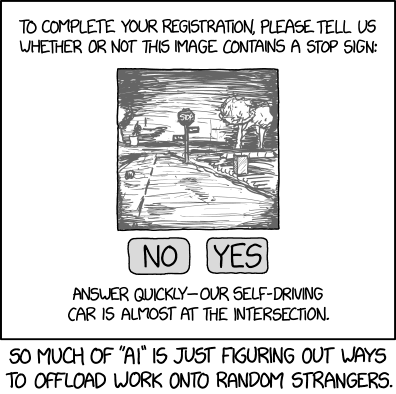 It turns out that nobody really knows in advance what a neural-net or other deep learning algo chooses as criteria for identifying a Stop sign. But some clever hacker-type guys have figured out how to change a few pixels in the image and get the algo to completely fail -- while not changing the image in a way noticeable to the human Mark-I eyeball. check out, for example, arXiv:1312.6199v4 [cs.CV] 19 Feb 2014 , "Intriguing properties of neural networks"
cellocgw wrote: . But some clever hacker-type guys have figured out how to change a few pixels in the image and get the algo to completely fail -- while not changing the image in a way noticeable to the human Mark-I eyeball. Well, this is just a typical game theoretical arms race. (1) You solve a problem. Things do get better over time. Wondering if the launch of perhaps the stupidest "We are hip to new technology" TV show since Scorpion, "Wisdom of the Crowd," triggered this drawing. Until some time ago, such forms were predictable. The always came up, I entered a captcha, and was done with it. Then came the smart ones. Sometimes they figure they don't have to verify me, sometimes I need several rounds until they consider me human. The first generation was homogeneous. All had the same shape, the card slot was at the same position and it made a peep everytime the user was required to perform an interaction. In the second generation, they added credit-card support and became more varied. Some had the card slot at the top, some at the bottom. And for many, the sounds were developer feedback, with the sounds being entirely uncorrelated with whether the user has any action to take. Now with NFC-enabled debit cards it is slightly better, but again there is inconsistency. No way to tell beforehand, whether you have to enter a PIN. Additionally while most readers will just ask for the PIN, our canteen's readers require inserting the card before entering it (which I haven't seen anywhere else so far). jonhaug wrote: (1) You solve a problem. Come now, Goto is for noob-lords. I fix. An ultimate solution to the Trolley Problem: crowdsource the decision, and then have the injured party sue everyone who voted for the injury. Distribute the settlement among everyone who voted the other way. On the subject of captchas, did they run out of text to digitize, or did algorithms just get too good at digitizing text to make it useful anymore? Archgeek wrote: Come now, Goto is for noob-lords. The version I heard, it was Russian vs US tanks, but apparently it was tank/no tank as you say. Here's a discussion of whether or not it's true. cellocgw wrote: Wondering if the launch of perhaps the stupidest "We are hip to new technology" TV show since Scorpion, "Wisdom of the Crowd," triggered this drawing. I recently saw an episode of Bull based around a self-driving car. I almost couldn't watch it. The AI was Turing-test-passingly human, and the startup that designed it was a bunch of kids whose previous projects included a robot surgeon and a cure for cancer, or something. No matter that their "inventions" were in completely different fields. These kids were clever enough to do anything. HehEhEh, yes, yes it is. It's disturbing how many languages will evaluate that to while(true). Welp, it's one line, but does it make a difference under the hood from a while loop's single branch? Also, is that an operator or a warding glyph? I'm lead to wonder if they'll unironically implement a bijection <==> operator next, for those "if and only if" (or "iff") conditions. When was the last time a noob learned a language that featured a goto? I'd expect the Linux kernel to contain GOTOs because it is written "rather assemblerish C" and that JMP is more or less necessary in assembler and they want the compiler to emit a JMP. I'm wrong. Looks like they are making it too easy for even non-real programmers to program FORTRAN in any language (disclosure: I learned OO to write debuggable code after writing a bunch of FORTRAN code in Python. After a month I couldn't debug the FORTRAN code, but had the same thing debugged in a day after writing python in python. Don't do asynchronous network code in FORTRAN). Self-driving cars? That's nothing. Microsoft just invented the self-flattening pedestrian. Shaped-charge exploding batteries in the Windows phone, ignited when a Google car passes closely. The phone appears undamaged. The results look just like vehicular homicide. See you in court, Page and Brin! OP Envelope Generator said: "Crowdsourced steering" makes me think "Let Twitch drive you to work". Reminded me of a serious (?) paper I read some time ago about "democratic self-driving buses" where the all passengers would have keypads for entering their desired destination. The bus then processes that data and computes the optimal route for its current riders. Wasn't so much "AI" as it was solving for the optimal path between nodes in a network. It might have been a paper on game theory. Made sense to me at the time. Then I forgot about it until this comic. Wondering now if something like that is part of the AI in multi-passenger autonomous vehicles (like taxis). One way you can help robots destroy the world is by playing https://quickdraw.withgoogle.com. Archgeek wrote: Welp, it's one line, but does it make a difference under the hood from a while loop's single branch? Also, is that an operator or a warding glyph? I'm lead to wonder if they'll unironically implement a bijection <==> operator next, for those "if and only if" (or "iff") conditions. Haskell people really like using lots of >, <, =, -, *, $ for their functions. So far I haven't seen an operator of more than 3 symbols, fortunately. The (>=>) (type (b -> m c) -> (a -> m b) -> (a -> m c)) is kinda function composition with monads, like ∘ (type (b -> c) -> (a -> b) -> (a -> c)) is regular function composition. Actually, there's no need for mfix and (>=>) since regular fix and (.) work fine on monadic stuff too and actually neither fix is working as expected. Whichever name you choose, it's going to be lame in at least one of the two spots. I'm disappointed that clicking on Yes or No didn't do something spectacular in XKCD form. orthogon wrote: Like the way beginners and professional electricians will strip wire using a pair of pliers, whilst people with some skills will use the proper tool for the job. The pros don't need one; the beginners don't have one, and might not even know they exist. Is there a word for this phenomenon of non-monotonicity? Pssshht, pliers are so pro-ish noob. The real noobs strip wires with a pair of scissors or their teeth. Heimhenge wrote: OP Envelope Generator said: "Crowdsourced steering" makes me think "Let Twitch drive you to work". Isn't that exactly the Traveling Salesman problem? I'd heard of it mainly as a computational complexity thing, but I guess AI approaches could find good suboptimal solutions. Blimey, I'd forgotten about teeth. That was my preferred method for years. Heh, and pros who've gotten needlessly good can strip wires with nearly anything, including the claws of a passing housecat. somitomi wrote: Pssshht, pliers are so pro-ish noob. The real noobs strip wires with a pair of scissors or their teeth. Did you stop when you were down to two teeth, or could you strip wire with the jagged remaining single tooth? edit: Second question: spit or swallow? edit edit: Third question: If swallow, what is your favorite insulation flavor? Chewing on a nice bit of PVC helped me concentrate on the connection I was making. I'd spit it out eventually. I did lose a bit of my lower left incisor recently, but if that was caused by my youthful wire stripping activity, there was about a three decade delay after I stopped doing it! Heimhenge wrote: Reminded me of a serious (?) paper I read some time ago about "democratic self-driving buses" where the all passengers would have keypads for entering their desired destination. For the past few days, now, I've been trying to ID a comedy sketch (could be anything from Monty Python to Little & Large, as far as my memory goes for what show it was on) which had a bus where every seat had a steering wheel (and implied accelerator/brake? ), so that everybody had an input. Perhaps according to how much they fed into their personal coin-slot, to dictate how much proportional influence everybody input to the vehicle. I know what you're thinking of: recent news coverage of our government's approach to Brexit. Your government has an actual bus with 40 steers? I wish ours was as cool. Flumble wrote: Your government has an actual bus with 40 steers? I wish ours was as cool. jonhaug wrote: I frequently fail at the Türing test when I typically get "Click on the images that contain a car" and have to try over and over. These cars are trying to pass the Touring test. Which is both easier and harder in certain ways. orthogon wrote: Reminded me of a serious (?) paper I read some time ago about "democratic self-driving buses" where the all passengers would have keypads for entering their desired destination. The bus then processes that data and computes the optimal route for its current riders. Wasn't so much "AI" as it was solving for the optimal path between nodes in a network. It might have been a paper on game theory. It's not quite exactly the Traveling Salesman problem. It has an extra twist that the famous problems lacks: A "bus" inherently describes a vehicle that makes frequent stops, to add and/or lose passengers. At every such stop, the list of destinations will often change. This could lead to a problem that has popped up in a number of "clever" disk-drive optimizations: Destinations at the outer ends of the travel path can easily get "starved" because there's always a closer destination which may be a shorter distance away in the opposite direction. When this bug pops up with disks, the usual solution is to restrict the allowed choices to those that are "forward" in the current direction, and ignore choices that may be closer but require reversing the direction. When the last destination in the current direction is reached, the direction is flipped. This is trivial on a disk drive that has only "inward" and "outward" directions. But our AI bus would presumably service a 2-D area instead, and a more complex algorithm would be required.